If an apple a day keeps the doctor away (see below), it stands to reason that an apple dessert helps, too. We have two slow-cooker apple recipes for you today. The second is like apple pie filling. Both are classic fall and winter desserts, suitable for weeknights or for company. They can be served warm, at room temperature or chilled. While you can prepare both recipes in an oven, a slow cooker with a liner saves you from scrubbing a pan—and leaves the cooked apples juicier, too. Both recipes were developed by Reynolds Kitchens. Prep time is 20 minutes, slow cooker time is 3 hours. You can make the recipe even healthier by replacing the brown sugar with half as much agave syrup*. While there’s not a lot of refined sugar in the recipe, every little save helps. 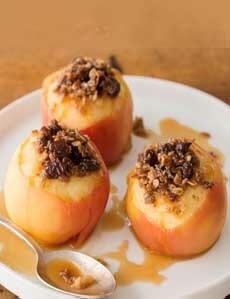 “Baked” apples from the slow cooker. Photo courtesy Reynolds Kitchens. *Want to cut back on sugar? A better choice than sugar is agave nectar, a low-glycemic natural sweetener from the agave plant. Agave nectar has a glycemic index (GI) of 32, half that of table sugar (GI 60-65). Honey has a GI of 58, pure maple syrup has a GI of 54. Here’s more information on agave. 1. LINE a 5- to 6-quart slow cooker with a Reynolds Slow Cooker Liner. Place the sliced apples in the liner. 2. COMBINE the oats, raisins, brown sugar, butter and cinnamon in a small bowl. Spoon the mixture into the centers of the apples, patting down with the back of a spoon or a narrow metal spatula. Mound any remaining oat mixture on top of the apples. Pour apple juice around the apples in the cooker. 3. COVER and cook for 3 hours on low. 4. TRANSFER the apples to serving bowls and drizzle with the cooking liquid. Prep time is 15 minutes, slow cooker time is 3 hours (low) or 2 hours (high). 1. LINE a 5-to-6 quart slow cooker with a Reynolds Slow Cooker Liner. Open a slow cooker liner and place it inside a slow cooker bowl. Fit the liner snugly against the bottom and sides of bowl; pull top of the liner over the rim of the bowl. 2. PLACE the apples in the bowl and drizzle with lemon juice. 3. MIX the granulated sugar, brown sugar, flour, cinnamon and nutmeg in a medium bowl. Sprinkle the mixture over the apples; stir gently with a rubber spatula to coat the apples. Drizzle with butter. 4. PLACE the lid on the slow cooker and cook on the low-heat setting for 3 hours or on the high-heat setting for 2 hours, until the apples are done. 5. CAREFULLY REMOVE the lid to allow the steam to escape. 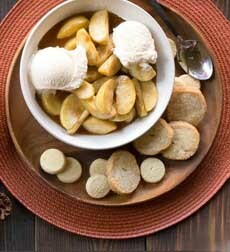 Transfer the apples to serving bowls and top with ice cream or whipped cream; or spoon the apples over a scoop of ice cream. Serve with cookies, if desired. 6. COOL the slow cooker completely; remove the liner and toss. Do not lift or transport the liner with food inside. By the turn of the 20th century, a number of variants of the rhyme were in circulation, including the one popular in the U.S. Most historians believe that the apple originated in the Dzungarian Alps, a mountain range separating China from Kazakhstan and Kyrgyzstan (far away from the Middle East/Garden of Eden). Scholars believe that the fruit tree in the Middle East, the designated home of the Garden Of Eden, may actually have been a pomegranate. *According to Phrases.org.uk and medical resources: Apples contain vitamin C, which aids the immune system, and phenols, which reduce cholesterol. Apples help to reduce tooth decay by killing bacteria that adhere to the teeth. Cornell University researchers believe that the quercetin in apples protects the brain cells against neuro-degenerative disorders such as Alzheimer’s Disease.